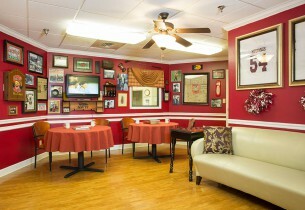 The rooms at Perry County are uniquely designed to provide an atmosphere reminiscent of home. 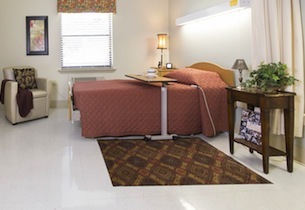 Therapeutic beds, comfortable chairs, color-coordinated curtains and room accessories and ample closet and storage space are provided for the residents’ comfort. Residents and families are encouraged to individualize rooms with personal items brought from home to make rooms more cozy and home-like. Money, jewelry and other valuables, however, should not be stored in resident rooms. Perry County Nursing and Rehab does not have set visiting hours. 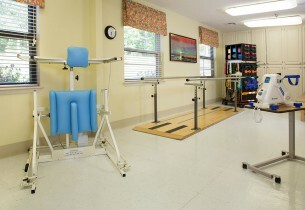 We view this facility as the “home” of each resident. We would ask that if visiting on evening and weekends that noise levels be kept at an appropriate level as they would be in your own home. Perry County provides transportation to and from appointments. We do ask for a 7 day notice if you or your family member makes the appointments so proper transportation can be arranged. 6) Do I bring my family member’s medication upon admission? 7) Can food be brought into the facility? 8) What options are there for paying for nursing home care? 9) Is Perry County a smoke-free facility? Perry County is a smoke free facility but designated smoking areas are provided for our residents that smoke. For the safety of our residents, regularly scheduled smoke breaks are planned throughout the day..